Teoscar Hernandez has put up solid numbers at home this season, but it's what he's doing on the road that's really starting to make people pay attention. Tuesday was just another night at the (home-away-from-home) office. The Astros' No. 13 prospect homered twice, doubled and drove in five runs to lead Class A Advanced Lancaster to an 8-4 win over Bakersfield at Sam Lynn Ballpark. Hernandez slugged his seventh and eighth homers of the season while extending his California League lead with 41 RBIs. "For me, it is just the same approach," he said through teammate and translator Ruben Sosa. "But I guess I have had better results on the road. I stay with the same approach. I just try to come out every day and work hard and get better. "I felt good. The most important thing tonight was that the team won and that I was hitting the ball hard. I had a good approach at the plate. I was looking for specific pitches and putting good swings on them." In 17 games at The Hanger in Lancaster, Hernandez is batting .288 with seven extra-base hits and eight RBIs. On the road, he's hitting .309 with 19 extra-base hits and 33 RBIs. He's reached base in 24 of 26 games away from home, with 12 multi-hit efforts. To put that in perspective, the 21-year-old outfielder has more RBIs on the road than all but five other California Leaguers have in total. Or, put another way, only 25 Minor Leaguers have driven in more runs than Hernandez has on the road alone. Only Fresno's Adam Duvall (44) and sluggers Giancarlo Stanton of the Marlins (43) and Jose Abreu of the White Sox (42) have more RBIs in affiliated ball than Hernandez, who moved into a four-way tie for second in the Minors. Against Bakersfield, Hernandez slugged a solo homer off Blaze starter James Allen (2-4) with one out in the first inning and doubled home Tony Kemp with one out in the second. After grounding out in the fourth and sixth, the native of the Dominican Republic smacked a two-out two-run homer on the first pitch he saw from reliever Sean Lucas in the eighth. "I was looking for a good pitch to hit," Hernandez said of his first-inning homer. "The first pitch was a fastball. The second was a ball that I did not want. Then he threw me a hanging slider that I hit pretty good, and the ball went out. [The second homer], I still had the same approach -- I was looking for a fastball. I got that pitch and put good wood on it." 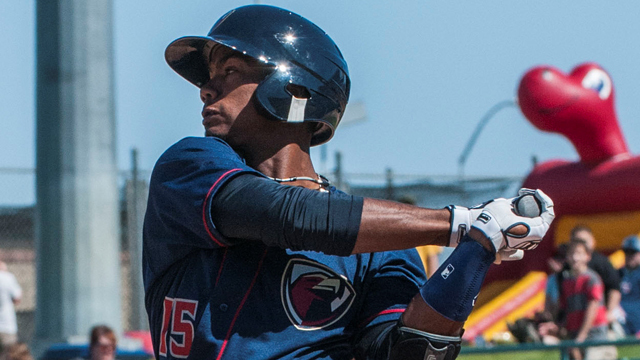 In the first five games of the JetHawks' seven-game road trip, Hernandez is 9-for-23 with four homers, 14 RBIs and eight runs scored. Now in his third year in pro ball, the non-drafted free agent is experiencing the Cal League for the first time. Signed by the Astros in 2011, he batted .274 with seven homers, 27 extra-base hits and 16 stolen bases in 65 games in the Rookie-level Dominican Summer League in 2011, then hit .243 with five homers and 23 RBIs in 59 games across two levels the following season. Last year, his first starting in a full-season league, Hernandez hit .271 with a career-high 13 homers, 55 RBIs and 24 steals in 123 games with Class A Quad Cities. Hernandez attributes much of his early-season production to batting second in a lineup that features Kemp ahead of him and top Astros prospect Carlos Correa -- who was given the evening off Tuesday -- behind him. "I like batting behind Tony Kemp because he is always on base," Hernandez said. "He is also a guy that has good at-bats. And hitting in front of Carlos, I see a lot of good pitches because teams don't want to face him with men on base. I want to get on base because I know Carlos can do some damage." Carlos Perdomo contributed three hits, two RBIs and two runs scored on Tuesday, while Kemp finished 2-for-5 with a double, an RBI and a pair of runs scored out of the leadoff spot. JetHawks starter Brian Holmes (1-1) allowed four runs on four hits, including three homers, and a walk while striking out four batters over five innings. Marquez Smith, Seth Mejias-Brean and Juan Perez smacked solo homers in a losing effort.